Whatever the season or the setting, your customers are eager and expectant that the items they buy from you will arrive safe and sound. It's always great to cheerfully take their money, but will you also take the time to properly pack what they've purchased? Whether you're caught up in the hectic holiday season or simply scrambling to keep up with customer orders (good for you), pause just a moment to consider this quick refresher on how to pack like a pro, quickly and confidently, to ensure the goods will still be good when they arrive to your buyer. Photos or other non-breakable flat items: Use standard manila envelopes with a same-sizes piece of cardboard for stiffening. For particularly old or delicate flat items, consider putting the item in a plastic sleeve then sandwiching between two pieces of cardboard. Don't just lick that envelope flap; use an additional strip of packing tape to seal the envelope shut. If it's a particularly large item, consider rolling it (if it won't cause damage) and sending it in a sturdy mailing tube with both ends-caps secured with packing tape. Glassware, pottery and other fragile items: Wrap the item in light tissue paper first then wrap it with bubble wrap. Put it in an appropriate sized box with a cushion of packing peanuts around the item. Then, put this box into another box, again using a cushion of packing peanuts around the inner box. Styrofoam sheets also work great as outer box siding material. This might seem like a bit of over-packing, yet if the item is particularly fragile as well as valuable then this is the most reliable way to ship such goods. Framed items: Size matters here, and you'll need to size up the job to see if it's within your capability to do a good job with the packing supplies at your disposal. Before you start, though, if the item is behind glass, it's best to disassemble the piece and pack the elements separately. Bubble pack and foam sheets are a must here, and you should wrap frame corners with sheet foam to prevent them from puncturing the shipping container or causing damage to the piece itself (be it a litho, photo, or whatever). Although you can purchase special packing boxes specifically for framed items, if the piece is too valuable or too unwieldy for your comfort, take it to a shipping center to handle for you. Big tickets: If it's too big to handle or if you feel you'll have to improvise a patchwork of packaging—or maybe you just don't think you'll be able to get it in and out of your car when you're all done—hand the job over to a pro. It's the safest bet in the long run. The little things: Whether a small piece of jewelry, a stamp, or any other "little" collectible or item that could have big value, be sure it doesn't get lost in the mail. First, put the item in an appropriate-sized box with the right amount of packing material to cushion it. Next, put that little box into a medium-sized box with appropriate interior cushioning; this makes it "visible," since extremely small packages are often lost in sorting machinery or within delivery vehicles. One USPS employee imparted this bit of wisdom: "If you can shake it, we can break it." All items you ship should be given the shake and rattle test: Before sealing an outer box, hold the flaps closed and give the item a few shakes. Do you hear any movement inside? If so, you might want to add a bit more interior padding until it's whisper quiet in there. Movement could allow the opportunity for items to shift and become damaged during their journey to their new home. If a little packing cushioning is good, a lot should be great, right? Not really. Too much interior packing can literally cause implosion. 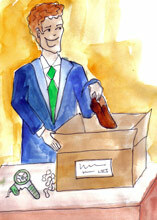 Remember that boxes will get bumped, stacked, kicked and tossed about on their sometimes-perilous journeys. Use enough interior packaging to keep the item safe and secure, but if the box bulges like an over-packed suitcase, the item inside will probably get unsafely squeezed the moment you seal it shut. So the philosophy here is to pack reasonably. Not only will too much packing lead to potential damage, but an overzealous packer might leave the recipient with something of a challenge to wrest a treasure from some impenetrable tape-and-cardboard sarcophagus. Seal the item enough to ensure it won't accidentally open in transit, but don't feel you have to extinguish an entire supply of tape, staples and whatever else to ensure the item's safety. Many buyers tell of accidentally damaging an item themselves as they struggled to free it from its packaging. Plus, don't forget that excessive packaging adds excessive weight—that results in excessive shipping costs. Lastly, if the item is particularly fragile, or will fare well if unpacked by a certain method, put special unpacking instructions inside the box, to be found the moment the recipient opens the package. Also, be sure to include an extra shipping label inside the package: Sometimes labels will come loose or become unreadable during the journey, or they might get wet (put a strip of clear packing tape over mailing labels going overseas). If a ship-to label comes off or becomes unreadable, some carriers will open the package in hopes they'll find an extra label to get the item on its way again. Oh, and if you accidentally overcharged the buyer a dollar or more for shipping costs, put a refund in an envelope inside the package. That sort of honesty and integrity keeps buyers coming back for more. Order and efficiency make packing and shipping a breeze. eBay sets new default DSR score for shipping cost. Free program for eBay sellers puts all shipping needs at merchants' fingertips.